The weekend series at Progressive Field between the Cleveland Indians and Baltimore Orioles was a perfect example of what happens when two teams, evenly matched in most respects, duke it out with their bullpens. In this series, Baltimore’s bullpen (which owns the second-lowest E.R.A. in MLB) showed how important it is to have trustworthy relievers to shut the door late in games, while Cleveland continued its up and down season, blowing two out of three games in the seventh inning or later. The Tribe’s bullpen woes are not new, but the team has had stretches of consistent productive outings from their relievers at various points of the season. This weekend, the problem reared its ugly head once again. Overall in 2016, Cleveland’s bullpen ranks 15th in MLB with a 3.70 E.R.A. However, the bullpen has lost eight games out of the Tribe’s 22 total losses, which ranks ninth-most in MLB, and often times, when the relievers have poor outings, it turns out to be devastating. If we look at this three-game series, specifically, it shows what can happen when the Tribe is in a close game against a tough opponent. Baltimore came into the series with a record of 26-19. Cleveland was 25-20 heading into Friday night. The two teams were both fighting for first place in their divisions. The Tribe’s strengths have been starting pitching and base hits. The Orioles strengths have been their power hitting and elite bullpen. The Orioles don’t have one of the better starting rotations in baseball, but their bullpen can pick up a significant amount of the slack. On Friday night, the Tribe sent Trevor Bauer to the mound, while Mike Wright got the start for Baltimore. Neither starting pitcher was great and it was a 3-3 game heading into the seventh inning. Zach McAllister entered the game and gave up a three-run home run to Mark Trumbo, making it 6-3 in favor of Baltimore. The Tribe would pick up a run, and go on to fall 6-4. In that game, Baltimore’s bullpen went 4.1 innings, allowing one earned run. Cleveland’s bullpen allowed three runs in three innings. On Saturday, the Tribe had a significant starting pitching advantage, sending Danny Salazar out to face Ubaldo Jimenez. The Tribe offense took advantage of Jimenez and hammered the former-Indian, scoring six runs in the first two innings. It was mop up duty the rest of the way, and to the Tribe’s credit, they put up five more runs over the next seven innings to pile onto their lead. Salazar’s performance was exceptional, as usual, allowing just two earned runs in six innings. Even with an 8-2 lead in the top of the seventh inning, the Tribe bullpen started to cause fans to worry when Tommy Hunter allowed two earned runs in 0.2 innings of work. Fortunately, the Tribe bullpen clamped down and the offense added on three more runs, just to remove all doubt and win 11-4. In the rubber match on Sunday afternoon, it was almost a carbon-copy of Friday night. Indians starting pitcher Mike Clevinger gave up three runs in the first inning (just like Bauer did on Friday) and the rookie would exit the game after allowing four runs over four innings of work. The Tribe offense fought back after trailing 4-0, and thanks to three home runs, tied the game at four in the bottom of the sixth. Let’s give some credit to Dan Otero, who has allowed only two earned runs in 21 innings this season, and pitched two shutout innings on Sunday. Once Otero’s turn was over, the bullpen imploded yet again. This time it was Jeff Manship, who gave up a solo home run to Hyun-Soo Kim (his first of his MLB career,) making it a 5-4 game in favor of Baltimore in the seventh inning. Austin Adams worked a scoreless eighth inning, and the Tribe offense had a chance to tie it back up in the bottom of the eighth. Jason Kipnis led off the inning with a single and Francisco Lindor roped a clutch double to right field, giving the Tribe runners in scoring position and nobody out. This caused Orioles manager Buck Showalter to insert one of the best setup men in baseball, Darren O’Day. In a bold move, O’Day faced off with Mike Napoli head-to-head, declining to use the intentional walk with a base open at first. O’Day got Napoli to ground out, holding the runners in check. Then, the Orioles opted to intentionally walk Jose Ramirez, who has been one of the best hitters in the Tribe’s lineup all season. Indians manager Terry Francona used a chess move of his own, calling upon Lonnie Chisenhall to pinch-hit for Juan Uribe against the tough right-handed reliever. Chisenhall worked a good at-bat, fouling his way into seeing eight pitches, but he watched as the ninth one, a slider on the outside edge, was called strike three. The previous four pitches were all fastballs inside. O’Day would strike out Yan Gomes to end the inning and strand the runners. That’s essentially what an eighth inning setup man is supposed to do, and is an example of why the Orioles bullpen has been so great this season. In the top of the ninth, Nolan Reimold belted a solo home run off of Hunter to make it a two-run game. Closer Zach Britton came in for Baltimore, and although the Indians made it interesting, getting two men on base with nobody out for the second-straight inning, the left-hander worked his way out of the jam, earning his 14th save of the season and striking out two Indians hitters in the process. So just to recap, in the three games between Baltimore and Cleveland, the Tribe’s bullpen lost two. The Orioles bullpen won two. Indians relievers allowed seven earned runs in 11 innings of work in the series. All seven came in the seventh inning or later. Baltimore’s relievers allowed three earned runs in 13.2 innings. It’s clear that when the Tribe has to undergo a battle of bullpens, especially against one of the elite in baseball, like Baltimore’s, the odds are not in their favor. Every team has its strengths and weaknesses. For the Orioles, starting pitching is not often reliable. For the Tribe, it’s reversed. What is concerning about those issues for both teams is that if they intend to make playoff runs, both of those problems could be a hindrance in reaching their ultimate goals. If we look at Baltimore, they are fighting with Toronto and Boston in the tough A.L. East. 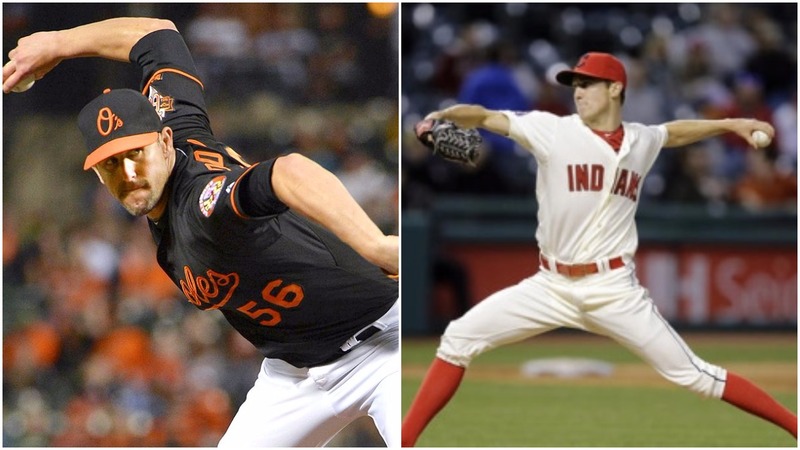 If the Orioles don’t upgrade their starting pitching, they may fall to either of those teams. Looking at the Indians’ situation, the Kansas City Royals, Chicago White Sox, and even Detroit Tigers pose a threat to Cleveland’s place in the Central. It’s areas like this that could keep the Tribe from playing in October. We’ve seen in years passed how a bad bullpen has hindered the Detroit Tigers from winning championships. Even with a star-studded rotation and potent offense. The Tribe could stand to improve at a couple different positions (namely, third base and right field,) but perhaps even more important will be figuring out what to do with the bullpen situation. There’s plenty of time left in the season, but the AL Central appears to be a three or four team race, and whichever team can add the necessary pieces before the crucial playoff stretch begins could end up on top when it’s all said and done.